Beacons, the low-powered transmitters equipped with Bluetooth Low Energy, that can be used to deliver proximity-based, context-aware messages are all set to revolutionize the way people interact with public spaces. These devices give brands an opportunity to interact with customers not only at a store level but also to target narrowly at an aisle or a fixture level. Beacons rely on the two-way communication (that the BLE technology allows) between an app and a strategically placed beacon. It’s the first proximity technology (with Apple already on board!) that is supported by all major mobile platforms. And according to experts, the beacon wave will continue to rise. The first ripples are already seen in the offline retail sector. We have written about ‘How Beacons are Poised to take the Brick-and-mortar Sales by Storm’ and how retailers are catching up to this trend. Beacons can be efficiently utilized in museums, parks, galleries and of course retail stores. Beacons are also being used for fun activities that help in brand promotion, some examples are CES Scavenger Hunt and Faberge’ Easter Egg Hunt. Download the ebook to know how beacons are being implemented in various sectors, and their potential uses in the future. 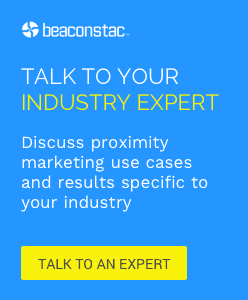 Thanks to beacons, the physical world is now the new digital channel. The opportunities are limitless and the game has just begun! How is beacon technology reshaping eCommerce?